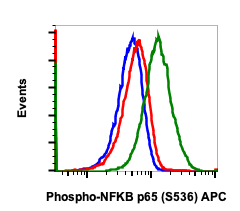 SH2 Domain-Containing Leukocyte Protein Of 76 KDa (SLP-76) is an adaptor protein that plays a role in signal transduction in T cells. 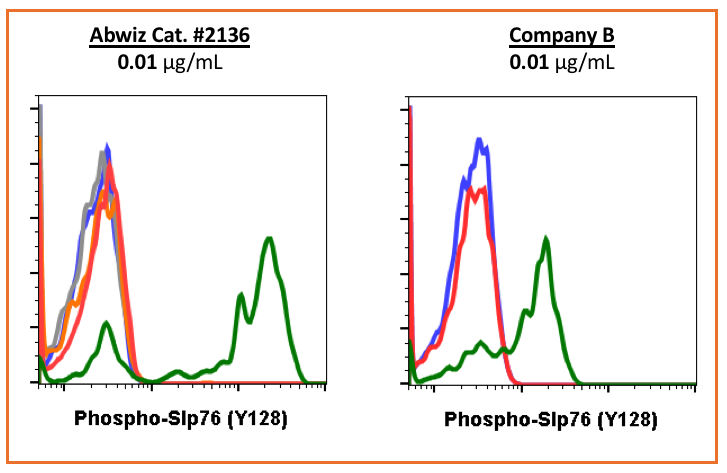 Studies using a SLP-76-deficient T cell line have demonstrated that SLP-76 is required for optimal phosphorylation and activation of both PLCγ1 and the Ras pathway. 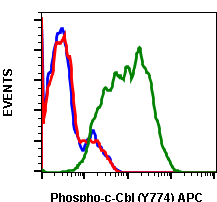 SLP-76 phosphorylation is mediated by Zap70 upon TCR stimulation. 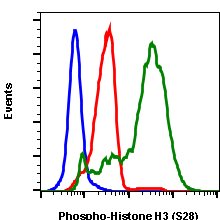 Within an N-terminal acidic region, SLP-76 possesses three tyrosines (Tyr113, 128, and 145), which are phosphorylated upon activation. 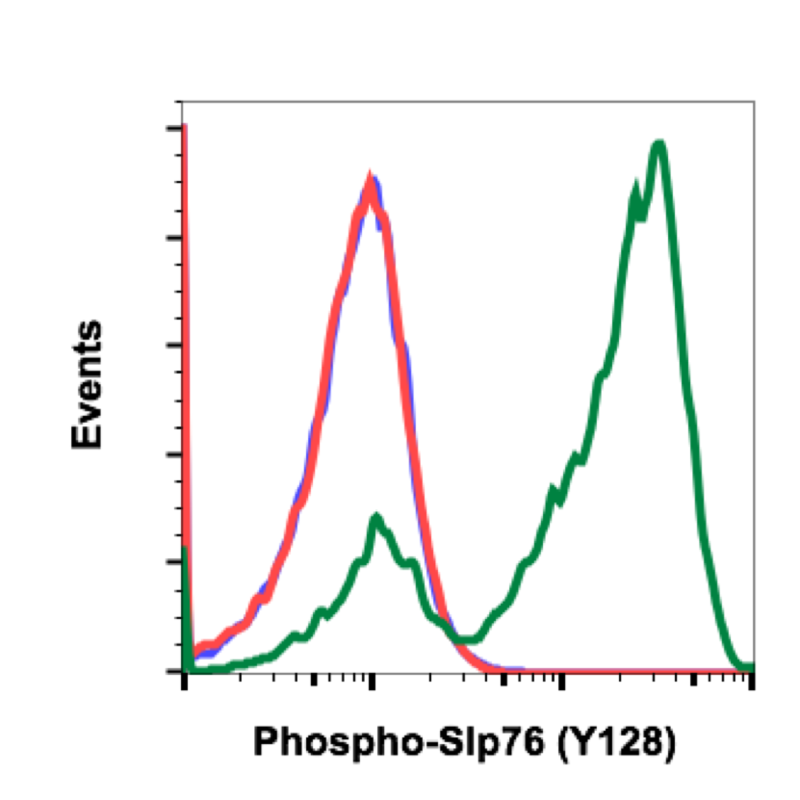 The sterile α-motif (SAM) domain of SLP-76 drives formation of dimers and higher order oligomers. SLP-76 micro-clusters at the immunological synapse enhance signal transduction and T cell activation. Zhang MS, Tran PM, Wolff AJ, Tremblay MM, Fosdick MG, and Houtman JCD. 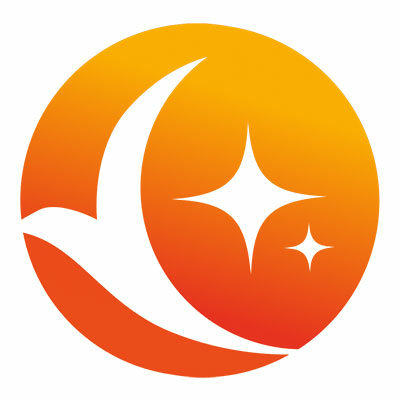 (2018) Science Signaling. 11:eaam9095. Yablonski D, Kuhne MR, Kadlecek T, and Weiss A. (1998) Science. 281:413-416. Thaker YR, Recino A, Raab M, Jabeen A, Wallberg M, Fernandez N, and Rudd CE. (2017) Journal of Biological Chemistry. 292:6281-6290. 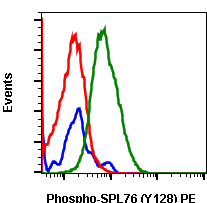 Flow cytometric analysis of Ramos cells secondary antibody only negative control (blue) or untreated (red) or treated with pervanadate (green) using 10 ng/mL Phospho-SLP-76 (Tyr128) antibody SLP76Y128-3F8. Cat. #2136. 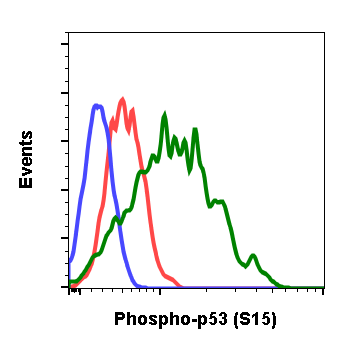 Peptide blocking flow cytometric analysis of Ramos cells secondary antibody only negative control (light blue) or untreated (red) or treated with pervanadate (green) or untreated and blocked with phospho-peptide (black) or treated and blocked with phospho peptide (gold) or untreated and blocked with non-phospho peptide (dark blue) or treated and blocked with non-phospho peptide (purple) using Phospho-SLP-76 (Tyr128) antibody SLP76Y128-3F8 at 0.01µg/mL. Cat. #2136. SLP76Y128-3F8 recognizes basal phosphorylation levels in mouse cells. 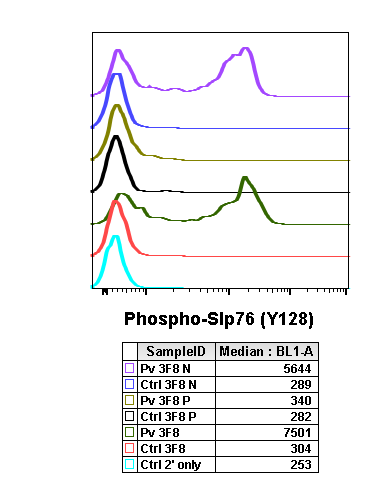 Flow cytometric analysis of NIH3T3 cells secondary antibody only (blue) or 0.1 µg/mL of isotype control Cat. 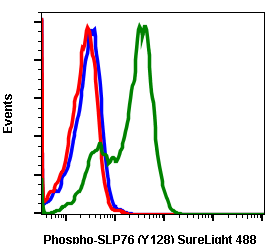 #2141 (orange) or of Phospho-SLP-76 (Tyr128) antibody SLP76Y128-3F8 (green) Cat. #2136. 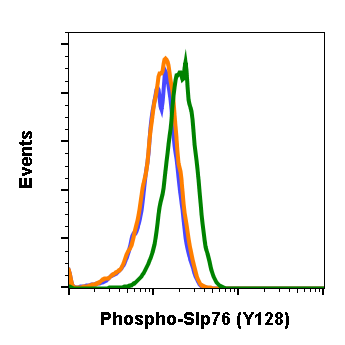 Flow cytometric analysis of Ramos cells secondary antibody only negative control (blue) or untreated (grey) or treated with pervanadate (orange) using 10 ng/mL of isotype control Cat. 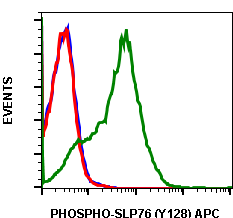 #2141 or untreated (red) or pervanadate (green) using 10 ng/mL of Phospho-SLP-76 (Tyr128) antibody SLP76Y128-3F8 Cat. #2136 or Company B antibody at 10 ng/mL.